I’ve had this project in the works for like three years… Seriously. It wasn’t until about two weeks ago that it started to become a reality though. Mostly it was just an idea. I didn’t have the resources to get the materials. Until we moved into our house in May and inherited a sickly little tree in our backyard. There was a good size limb that was already a goner and it was to become my victim, er… uhm, materials. – A large, sturdy tree branch. You could also use a thick dowel in a pinch. You can find them at Lowe’s and Home Depot or order them online . Mine is about 1 3/4″ thick and about 2 1/2 feet long. Make yours as big as you’d like. – Lots of smaller sticks. I used some sticks from my branch and cut them to about 6-9 inches long. You might find these in a park or take a drive up to the mountains and collect some sticks. I ended up using about 2 dozen. 1. 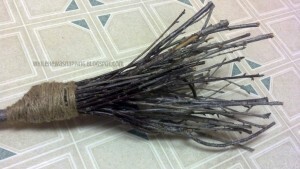 Cut the broom handle to your desired length. 2. Cut your smaller sticks to length. 3. Arrange the smaller sticks around one end of the large branch and secure with twine. 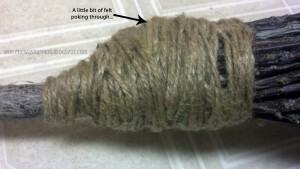 Tie the twine as tightly as you can. Maybe use a helper to cinch it down while you’re tying it up. I did a layer around the branch and tied that off. Then added another layer on. Repeat until your are happy with the thickness. 4. If your stick are sticking out like crazy (mine were), fill your large bucket with water and set the small stick end of the broom in the water. Let the sticks soak until they are pliable enough to shape them. I ended up leaving mine in the water about five days – however, that was partly because I forgot about it. Whoops. 5. When your sticks are shape-able, arrange them like you want them and use more twine to secure the shape. Let dry completely. I got a little over-excited with this part and undid my shaping twine before the twigs were totally dry and they warped and spread again. So… let it dry! 6. 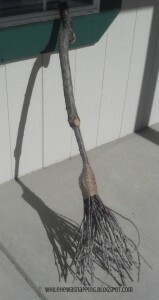 Wrap a piece of felt around the broom where your large branch and small sticks meet. Secure with hot glue. 7. Wrap twine around the felt until it’s completely covered. Tie off and secure with a knot or two. Don’t worry if a little of the felt pokes through. Because of the closeness of the colors, it’s not a big deal and really not noticeable. That’s it. You’re done. How cool is your broom?! And, for me, this project was totally free! Unless you count the price of our house as part of the project cost… then it was the most expensive project I’ve ever done! Haha. I think it’s awfully adorable… now I just need to figure out where I’m going to store this beast! Yes, that’s our fridge. And it’s not a small fridge either.